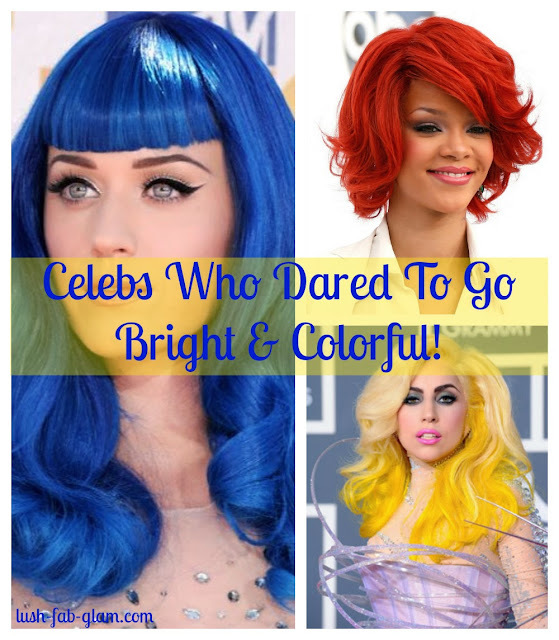 Lush Fab Glam Inspired Lifestyle For The Modern Woman: ﻿Flashback Friday: Celebs Who Dared To Go Bright And Colorful. ﻿Flashback Friday: Celebs Who Dared To Go Bright And Colorful. Earlier this week's singer Kei$ha was snapped rocking her new rainbow-hued hair color and since we can't quite decide whether we love it or not we decided to leave it up to you our fabulous readers! For today's flashback Friday we are featuring the celebrities who dared to take the bright hair color plunge and appeared in public with everything from bright pink, red and yellow hair wigs to blue, green and various tip-dyed shades. Some looked surprisingly amazing and others left us wondering what was she thinking? Read on to see the celebrities who made our ﻿'Flashback Friday: Celebs Who Dared To Go Bright And Colorful' list and tell us who you think looked fab in their new hair color and who's hair transformation was a fail! Female Rapper Nicki Minaj with a green wig. Singer Jordin Sparks with purple highlights. Actress Amanda Bynes with a blue wig. Singer Kei$ha with rainbow dyed hair. 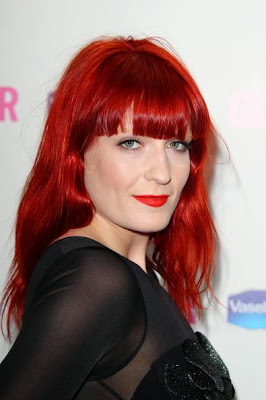 Singer Florence from Florence and the Machine with bright red tresses. Singer Katy Perry with dyed purple curls. Singer and X Factor Judge Demi Lovato with pink dyed tips. Singer and The Voice Judge Christina Aguilera with purple tips. Singer Rihanna with a bright red wig. Singer Lady Gaga with a blonde and yellow wig. Singer Katy Perry with a blue wig. Fashion Police co-host Kelly Osborne with purple hair. Singer Gwen Stefani with pink dyed tresses. Singer Britney Spears with pink and green dyed tips. Reality TV Star and designer Lauren Conrad with pink and ombre dyed tips. Actress Scarlett Johansson with purple dyed tips. Which celebrity do you think looked fab with their new hair color and who's transformation was a flub? Share with us by leaving a comment below. Can't believe I'm saying this but I like them all except for Britney. looks good on them they can get away with it, my friends would laugh at me if I showed up to class like that. Dyed tips looks good I tried it last summer but brown hair with blonde tips it looked pretty good. I think you have produced numerous truly interesting points. nicely, with so considerably class. Splendid one, man! Genuinely special things right here. I'm pretty pleased to uncover this site. I wanted to thank you for your time due to this wonderful read!! I like the hair colors.